This is one of the longest titles I’ve typed on this blog! The front of the box is a nice window where you can see the figures and the video inside. I love the SpartanWife…If it weren’t for her, I probably never would have got these! Everything all over this packaging is in three languages. English, Spanish (or Italian?) and French. The back of the package gives you instructions, and also shows off some other figures and vehicles from 200x. I do miss the 200x show! On with the review. This packaging is just landing in the trash. I’m not sure this could have counted as Mint On Card anyways. The box has had some abuse. Here is everything assembled, for your photography pleasure. The video is going to stay in cellophane. I believe I will display it with my 1987 movie VHS tape. Because neither is EVER going back into a VCR to be eaten. That’s why. And besides, I have “The Courage of Adam” on DVD. Here are the accessories. I activated the action feature of both shields this time. I prefer to display them like this. Skeletor’s activates by press of a button. You reset it by pushing that skull back up, and then the blades retract. He-Man’s works by turning that wolf head. His isn’t spring loaded, unfortunately. But it looks way cooler with the blades out. 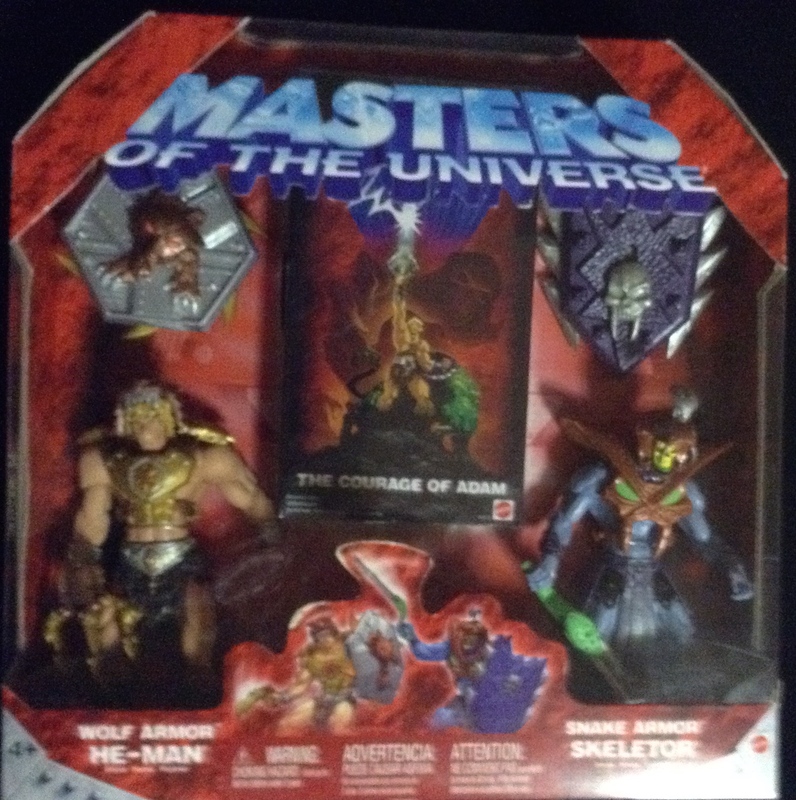 This is the first He-Man I’ve ever owned that didn’t come with a sword! 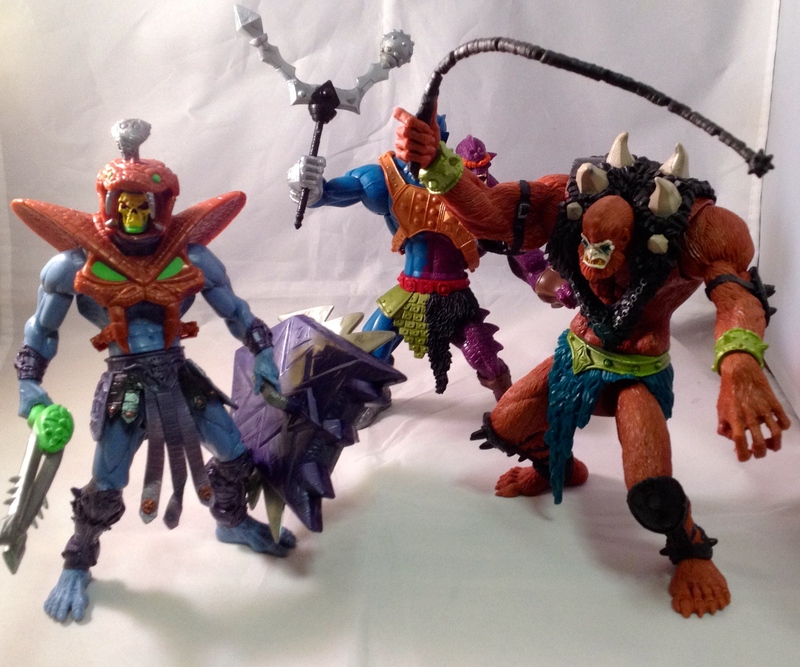 Also notable, He-Man’s helmet is removable…Skeletor’s is not. 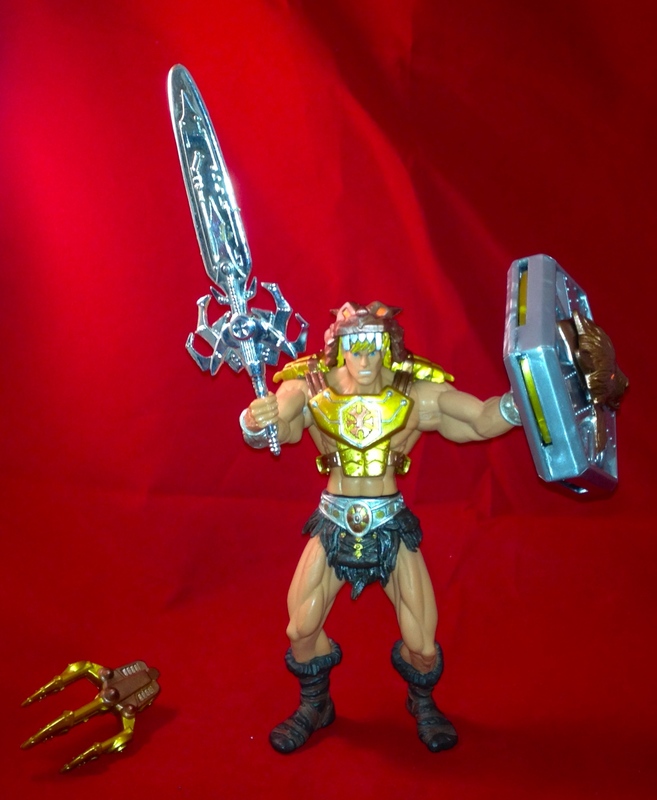 He-Man has a wolf claw weapon. And I’m not sure WHAT Skeletor’s weapon is. A gun? A sword? I tend to think those silver pieces are meant to be long retractable tentacles. So more of a gun. 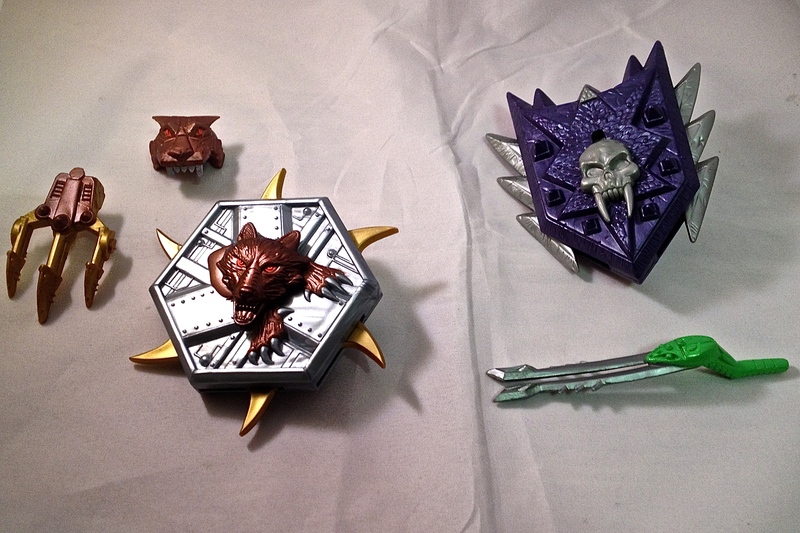 But then again, it could be that the two silver pieces are meant to mirror Skeletor’s double sword. I just don’t know. Here’s Skeletor. His shield is really heavy. 200x Skeletor tends to be sort of hunchbacked as it is. But in order to have him stand and hold the shield, you have to bend him backwards, pretty severely. The figure has a snake head on top of his helmet. I thought this must be a button for an action feature. Nope. Maybe the Horsemen intended it to be so? The armor is removable, but it looks to be two pieces. I don’t feel the urge to take it off…you can’t remove his helmet, so you would have a shirtless Skeletor with a snake hat. And what if I have trouble getting that armor back on? I have to add that the snake hat is glued to the hooded head that was on the original, non-variant version. Mattel really cut corners on this figure. And I don’t necessarily appreciate it. I do think these are cool designs. I might not understand them. But stuff like the mess that is on Skeletor’s head is pretty infuriating. Why isn’t that removable. Or at least, not GLUED TO HIS HOOD. Skeletor is fine below the waist. His loin cloth is elaborate. His toes look ever creepy. 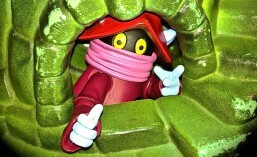 To bad he didn’t have claws on his feet, as he had in the cartoon and the Vintage figure from the 1980s. I wish they at least painted the nails black as a compromise. Skeletor also doesn’t have the torso punch. How did that get left out. I can make a comparison this time. We have what I believe to be Battle Armor/sound Skeletor from the 200x line. He has a spring loaded waist twist. And you can remove his hood. I’m just saying. He-man is superior to Skeletor in every way. 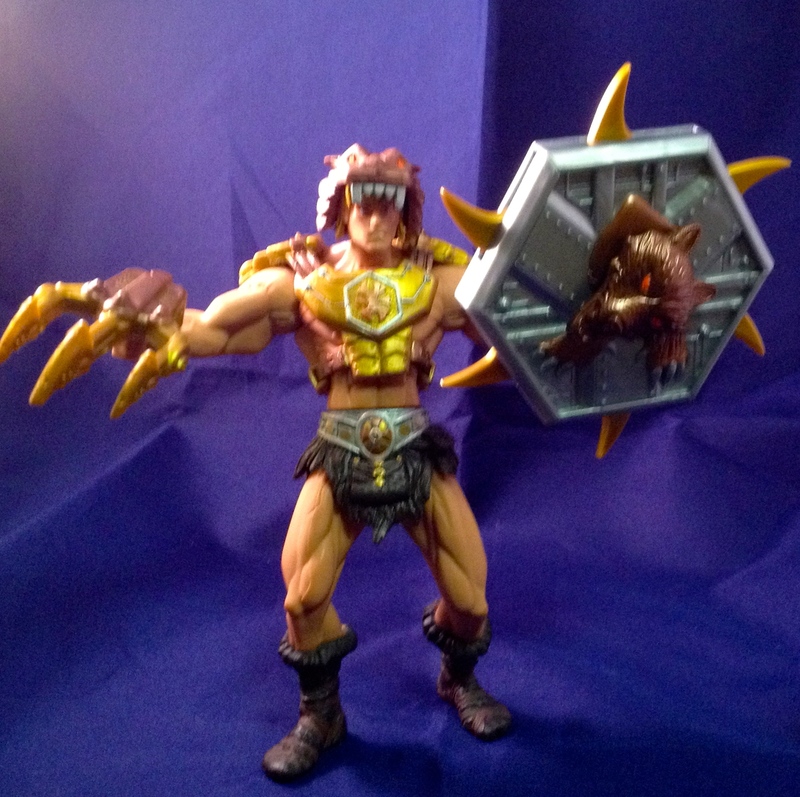 He has the same problem as Skeletor in that his shield is too heavy for him to stand and hold it as usual. I am not necessarily a fan of the way the He-Man holds his shields in 200x. Shields should strap to the arm. Not be held in hand. But this is an overall style criticism. He-man’s waist twist works great. His armor is removable. I generally have a hard time standing 200x He-Man. His legs are sculpted in an odd way. He-Man’s armor is a nice gold color. His furry shorts come complete with the little pouch that hangs from his belt. I tried out the sword from the 200x Castle Grayskull playset. This sword has good symmetry with the shield, matching the other shiny silver pieces. 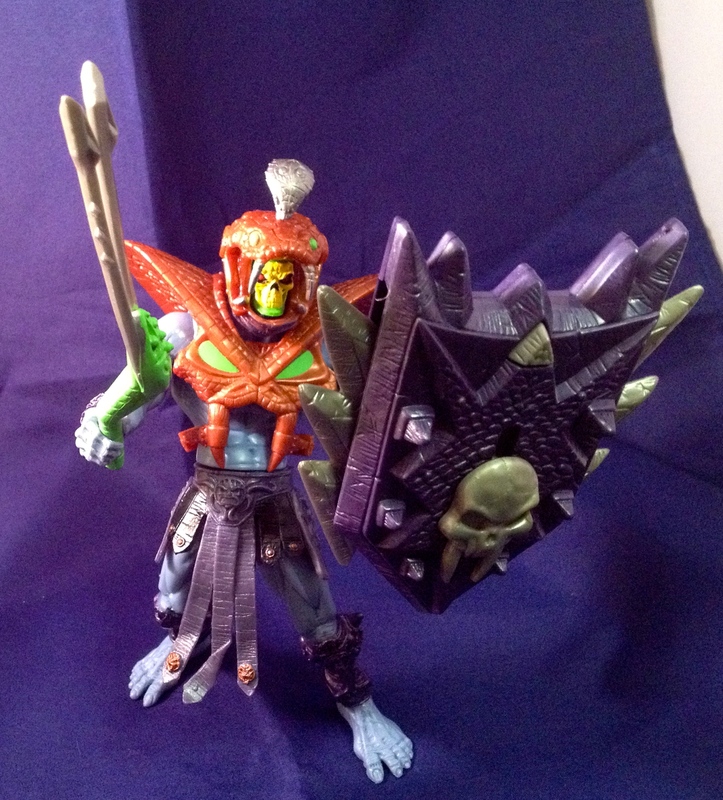 Skeletor’s figure has a very compromised feel to it. Like they intended for it to be more than it is. But had to cut corners. So there is no action feature. And the helmet is not removable. And they didn’t bother with a new head sculpt…hence the hood is still there under the helmet. 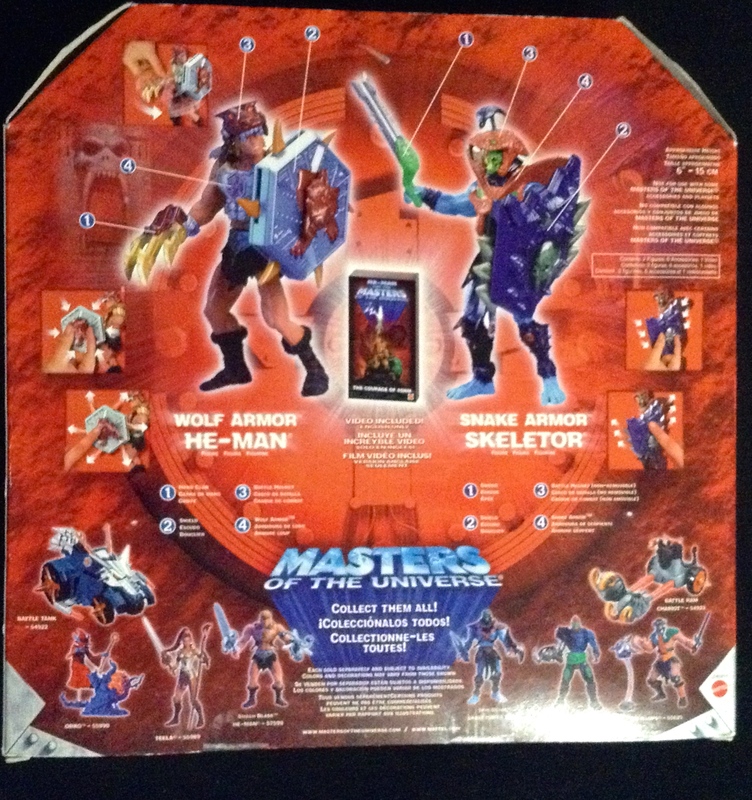 Add to these problems the fact that the figures can’t stand properly because of the weight of the shields, and the fact that He-Man doesn’t come with a sword. And the score is pretty low. But I don’t dislike these figures. They are fun! I think the shields’ action features are cool. Especially Skeletor’s with the spring loaded blades. He-Man’s shield, with the blades sticking out around it is especially cool looking. I rate 200x Wolf Armor He-Man at 3/5. His sculpt is great. He has a cool shield. It is a nice variant. He looks cool on the shelf. With the downside of not coming with a sword, or being able to stand holding the shield without being contorted. I rate 200x Snake Armor Skeletor as 2/5. He has a compromised feel. Unremovable Helmet. Dubious removable armor. A strange weapon. And can’t stand naturally holding the shield. On the other hand, the action feature on the shield is fun, and the overall look of the figure is nice. I’m not even going to bother rating the tape. Because these figures look so cool on the shelf, and that is their main function, I am going to rate them probationally 3/5 as a set. *I added the colon because it is supposed to be funny. 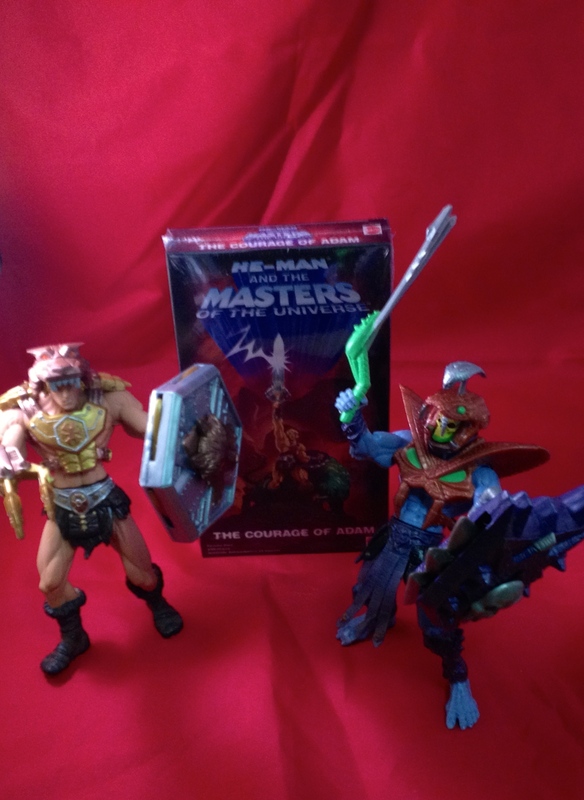 This entry was posted in 200x, He-Man, MOTU, Skeletor, SpartanNerd, Vintage and tagged 200x, He-Man, Skeletor, SpartanNerd, SpartanNerd Unboxing and Review. Bookmark the permalink.